The Only Other Animal In The Giraffidae Family Besides The Giraffe Is The? The Boxer Crab Clutches Which Of These Things In Its Claws As A Weapon? The giraffe family tree is a pretty lonely one these days. Once upon a prehistoric time, the Giraffidae family was a diverse one, spread out over Eurasia and Africa, and comprised of many different species. In fact, even when you step up the family tree into the realm of the superfamily the giraffe belongs to, Giraffoidea, it’s still a pretty lonely place with the entire Climacoceratidae family (prehistoric deer-like creatures that lived in Africa millions of years ago during the Miocene era) now extinct and only one animal in the Antilocapridae family still around (the pronghorn, also called the “American antelope”). With that in mind, you might be surprised to find out that despite the extinction-littered family tree of the giraffe, it has a nearby (and closely related) relative living right there in Africa with it. While the giraffe lives on the savannas of Africa where it uses its towering neck to harvest leaves from lofty branches, in the dense rainforests of the Congo, you’ll find its closet living relative, the diminutive (by comparison) okapi. At around five feet tall at the shoulder and a body length of around eight feet, it doesn’t immediately look like a giraffe but, upon closer examination, it does share many characteristics including: an elongated neck, large and flexible ears, short and hair-covered horns on the males of both species, a long and dark-colored tongue, lobed canine teeth, and a unmistakable walking gait. Both giraffes and okapis have a pacing gait wherein they move the legs on one side of their bodies at the same time, then do the same on the other side (other ungulates like horses, deer, camels, and cattle all walk with an alternating gait). 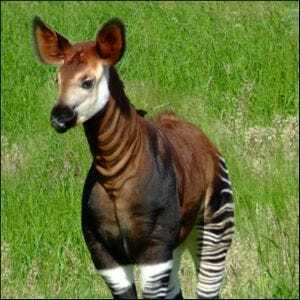 For years, the okapi was unknown in the Western world, despite extensive exploration of Africa by Europeans, and was referred to as the “African unicorn”—due to African natives telling the Europeans about the creature, but no Europeans ever seeing it. It wasn’t until the beginning of the 20th century that the okapi was positively identified, cataloged, and entered into the Giraffidae family. Image courtesy of Charles Miller.